"Thoughts from a heart shining bright in a dark world..."
In a world where material riches is often equated with spiritual blessing nobody wants less. Things weren't totally different in Jesus' times, either. Those who had wealth were often seen as more spiritual. They loved to fluent their riches. Let's not kid ourselves, we fall prey to the very same temptation. We want to measure our worth by what we have. We want others to do so, too. The book: ER nurse Macy Wynn learned essential, gritty lessons in the California foster care system: land on your feet and trust no one. 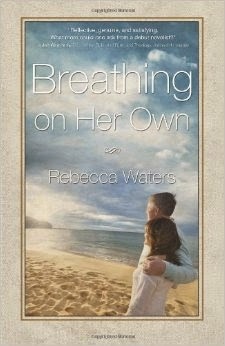 She’s finally located the fellow foster child she loves like a sister, but the girl’s in deep trouble. Macy’s determined to help, no matter what it takes. Her motto is to “make it happen” in any situation life throws at her—even when she butts heads with an idealistic cop. Deputy Fletcher Holt believes in a higher plan, the fair outcome—and his ability to handle that by himself if necessary. Now he’s been yanked from Houston, his mother is battling cancer, and he’s attracted to a strong-willed nurse who could be the target of a brutal sniper. When everything goes wrong, where do they put their trust? Sunshine warmed the slightly chilly air on a late spring afternoon. Determined to conquer the dreaded task before summer arrived, with all its sweltering heat, I asked my husband for help getting started. Four boxes stood in the corner of our garage. They’d been living there since we moved from out of state over a decade ago. Once in a while when we brushed past them, on the way to the car, I would make a mental note to go through them in the near future. I lay still that early winter morn soaking in the silence of the house. Our bedroom remained artificially dark by the drawn window shade. My head was pounding and nothing could stop the battle that raged deep within. The sound of the ringer on the phone interrupted the internal dialogue. Picking up the receiver I heard the voice of a woman from a Bible study group I’d attended at a local church. We’d not connected in a while due to my ongoing medical issues. She explained that God had told her to call me and read a page from her devotional Streams in the Desert. She didn’t know why or have anything else to say and only wanted to be obedient. “My child, I have a message for you today; let me whisper it in your ear, that it may gild with glory any storm clouds which may arise, and smooth the rough places upon which you may have to tread. It is short, only five words, but let them sink into your inmost soul; use them as a pillow upon which to rest your weary head. This thing is from Me. Have you ever thought of it, that all that concerns you concerns Me too? For, “he that toucheth you, toucheth the apple of mine eye” (Zech. 2:8). You are very precious in My sight. (Isa. 43:4) Therefore, it is My special delight to educate you. I would have you learn when temptations assail you, and the “enemy comes in like a flood,” that this thing is from Me, that your weakness needs My might, and your safety lies in letting Me fight for you. Later I’d discover that, even though it was the month of November, this devotional entry was from February 1st. What I’ve shared is only a portion. You can find the rest online here. I’d begun crying after the first sentence and when she finished reading, through a stifled sob, thanked her for her obedience before hanging up the phone. She didn’t know that I’d just been through one of the worst medical debacles ever. She had no idea that after three hours in the operating room a team of surgeons who’d promised they could release my contractured foot had deemed my case too difficult. She didn’t hear my “ugly crying” as it echoed throughout the surgical unit when I was informed, by some of the best, that my condition required a higher level of expertise. She hadn’t heard the bickering between specialists who each insisted it was the other who was afraid to operate. She couldn’t see that being “examined under anesthesia” had further crippled me. She wasn’t aware that as I lay there in the dark the tentacles of despair worked tirelessly to choke every remaining ounce of hope from my heart. But God had seen and heard it all. In fact, He knew about this battle long before it ever began. He had been with me every step of the way. Twice He’d spared my life. I’d traveled a very long road of sickness and suffering before arriving at this place. The corner of doubt and despair. And in that place He reached down and literally whispered in my ear. Using the voice of an unwitting obedient servant He reminded me that, not only was I in the center of His will, but that He would fight for me. Joy didn’t immediately flood my soul but regaining a sense of God’s presence brought tremendous relief. The next few days were spent unearthing myself from the fog of general anesthesia while fielding calls from three different physicians volleying my case back and forth like a hot potato. In some ways it was akin to a scene out of The Three Stooges. I listened a lot and spoke very little. Laughed once or twice. I had no idea what God was up to but He was the only One worth trusting at this point. That Saturday, I received a call from the specialist in East Tennessee who’d more recently been in charge of my care. He had set up an appointment on Monday with a surgeon over there. By this time, I felt a wide range of emotions and only slightly hopeful. On Sunday evening the phone rang. Boy did he open a can of worms. Before our conversation ended, I discovered that not only did this man know the surgeon; he’d worked with him in the operating room for years. He felt that the appointment was all God’s doing, promised to be in prayer, and offered additional words of hope before hanging up. I sat on the edge of the bed in total awe. Twice, in one week, God had used people who hardly knew me to deliver words of truth I desperately needed to hear. Our “church family” had long ago walked away. Most doctors didn’t even want to hear my name. But they were not God. God knew my name. Apparently He knew my phone number, too. He also knew which of His kids could be entrusted to obediently follow His nudging so that He could minister to me in a very personal way at one of the lowest points in my life. As I allowed it all to sink in I could feel the vice-like grip that despair had on my heart break loose. Although there was no way to predict the outcome of the next day’s appointment in that moment only one thing mattered--maybe two. God fiercely loved me and would walk with me all the way even carrying me if necessary. This was cause for great joy. 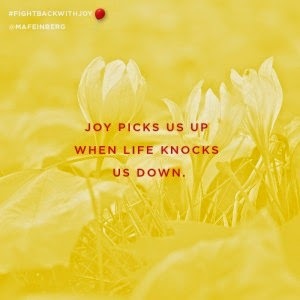 This difficult time in my life resurfaced recently while reading Margaret Feinberg’s book Fight Back With Joy. Feinberg is no stranger to suffering and pain having recently fought an intense 18 month battle with breast cancer. You might nod your head yes emphatically if you’ve never had more than a “bad hair day.” But if you’ve gone through or are currently going through gut-wrenching, heart-breaking, bone-crushing hardship, your response might be different. You might argue or ask questions like “what about when things seem to be unbearable OR unbelievable OR both? Can we experience joy then?" We can, but it requires shattering some illusions about joy first. Margaret does an excellent job of that. “Trials can become the gateway to greater joy, but these passages are fraught with obstacles. The roadside is dotted with land mines, inhabited by bandits, overgrown with briars. Telling someone to look for blessings in the midst of burden, however true, is hard to swallow and even more difficult to execute. But the spiritual growth we experience in trying times, though often more gradual and painful than we’d like, is occasion for celebration. The story I shared is just one example of a time when God has revealed Himself to me in a greater way while in a hard place. In those moments when the path grows increasingly painful, it seems that He fully has my attention and I become more aware of His presence in my life. The thorny places challenge me to trust Him in new ways and more clearly see Him working on my behalf. And often I am able to spot blessings that I would have missed otherwise. Oh how true this is. Life can be hard at times but it is possible to celebrate more, regret less, and stare down our greatest fears. Instead of cowering under adversity or curling up in defeat we can fight back with joy. Maybe you don’t know where to start. Margaret’s book is a perfect place to begin. I can't adequately put into words all that I've gleaned from this book. I was dying to get my hands on it and trust me when I say it did not disappoint. No matter what your circumstances, you can practice defiant joy. When you do, you will embrace a life that’s richer and fuller than you’ve ever known before—a life radiant with joy. I recently shared an interview with Margaret Feinberg along with a preview of the 6 Session DVD Bible Study which you'll want to check out. 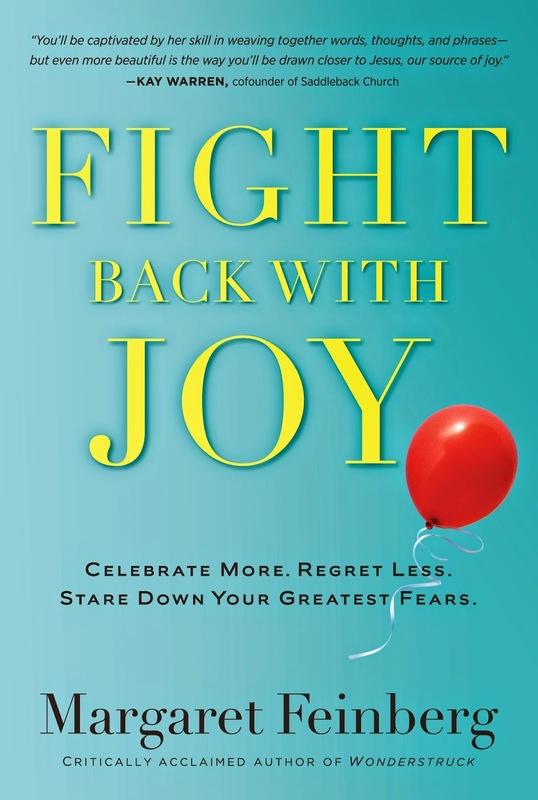 I also highly recommend that you pick up a copy of Fight Back With Joy at Amazon or Barnes and Noble today. 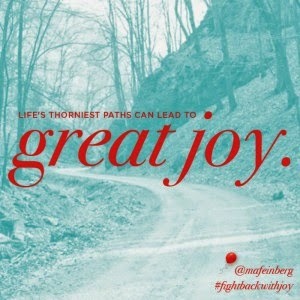 One of my favorite authors, Margaret Feinberg, has been through a brutal fight with cancer and shares the unexpected lessons she discovered along the way in her new book and Bible study Fight Back With Joy. It’s been inspiring to learn how Margaret has been practicing a defiant joy. The book is a phenomenal read and on my list of new favorites. I'll be sharing my review of the book and additional thoughts over the next few weeks. In the meantime, I thought you might like to get an insider’s look, so I am sharing an interview with Margaret and a sneak preview of the 6-Session DVD Bible Study. The book: Parents of specials needs children are exhausted. They've done all the research, consulted all the experts, joined support groups, gotten counseling, fought for the best life for their children. Often just caring for their children's needs and attempting to maintain a home maxes out parents' mental, emotional, and spiritual reserves. Laurie Wallin knows firsthand the difficulties of this journey. 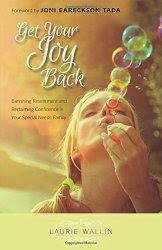 With Get Your Joy Back, she steps forward to make a bold, audacious claim: in the midst of this long-term, intense task, it is still possible to have an abundant life, full of joy. 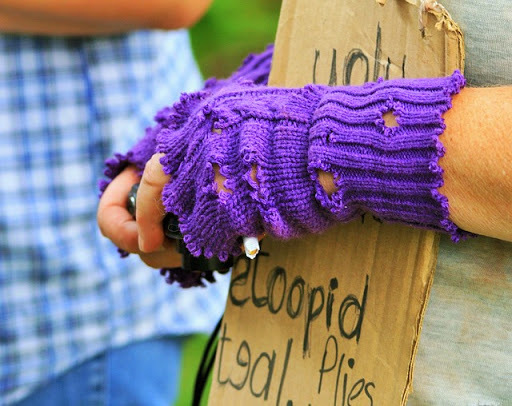 The key to radically changing daily life and restoring joy to the weary is forgiveness. Wallin gives parents a lifeline to find that restoration, pulling them back to shore when they feel like they're drowning. There comes a moment in every believer's life when someone that they care about approaches them in the midst of suffering and sorrow for advice. If you haven't experienced this yet, you will. Perhaps a "picture perfect" marriage is crumbling, they are dealing with a wayward teen, the company is downsizing and they're about to go under financially, or depression and anxiety is robbing them of sleep. Situations and circumstances vary but one truth is universal. We live in a fallen world--and sometimes it falls on us. Most of us know how to provide comfort at some level. We validate the pain, offer our prayers, give advice or exchange stories, and when all else fails we give hugs. Lots of hugs. But what about after the hug? Initially I wasn't going to join. 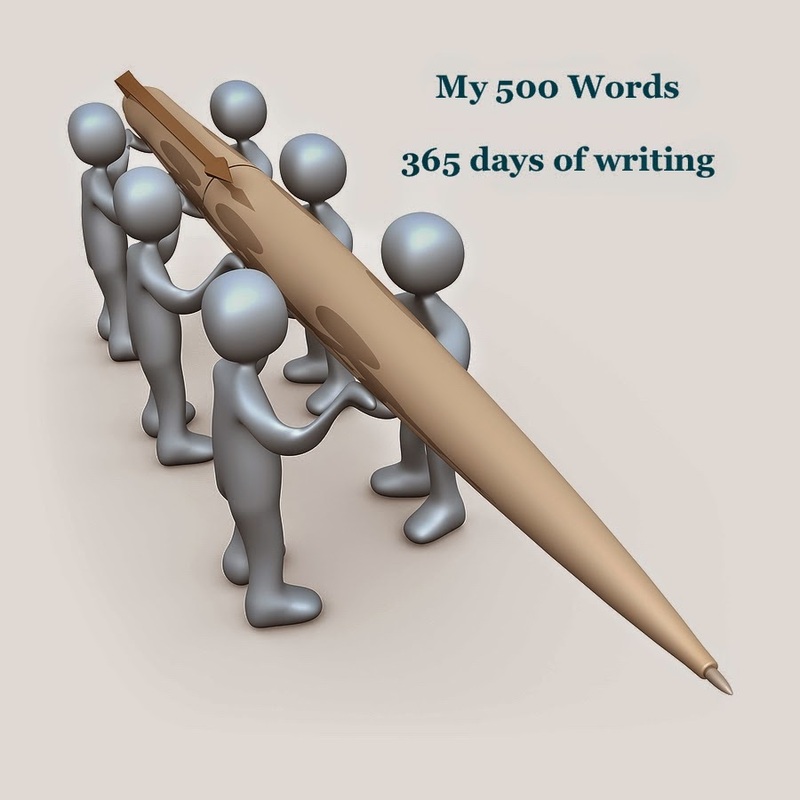 Accept the challenge by Jeff Goins to write 500 words a day in the month of January, yes. Add yet another Facebook group into the mix of my already cluttered life, no. Getting stuck the first day changed my mind. Meandering over to the link for the private group I found myself asking to join. My request was accepted immediately. A prompt was pinned at the top of the page. Several years ago, after finishing my doctoral studies, I went through the process of becoming certified as a biblical counselor. Along the way, I've met some very knowledgeable people with loads of experience. One of the people who I have learned tons from is Dr. Bob Kellemen. Bob is the Executive Director of the Biblical Counseling Coalition, the Vice President for Institutional Development and Chair of the Biblical Counseling Department at Crossroads Bible College, and the Founder and CEO of RPM Ministries. Obviously Bob stays pretty busy. And that's only a partial bio. I'll share the rest when I post my review of the book. For seventeen years he served as the founding Chairman of and Professor in the MA in Christian Counseling and Discipleship department at Capital Bible Seminary in Lanham, MD. Bob has, also, pastored three churches and equipped many biblical counselors along the way. 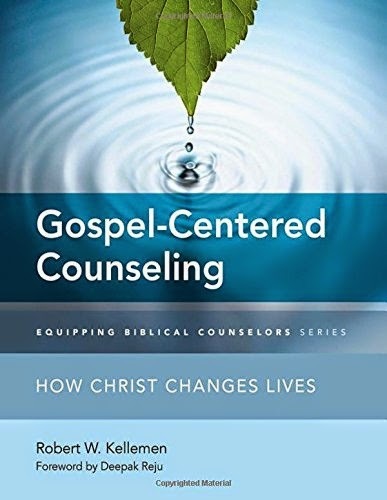 Additionally, he has written over a dozen books, most of which I have read, including his latest book Gospel-­Centered Counseling: How Christ Changes Lives. Molly Tipton and her husband are looking forward to retirement, but Molly’s life suddenly spirals out of control when her oldest daughter is involved in a terrible accident. An icy road and a sharp turn leave one woman dead, another clinging to life. While two families grieve, details emerge that reveal Molly’s daughter was driving under the influence. As she prepares her daughter for the prospect of a vehicular homicide lawsuit, Molly discovers her oldest child is not the only one injured and forced to deal with past mistakes. If it’s true that time heals all wounds, what are we to do with our scars? To be honest, because this was the author's debut novel, I wasn't quite sure what to expect. Would it be slow moving? Will the plot be believable? Will it keep my attention?